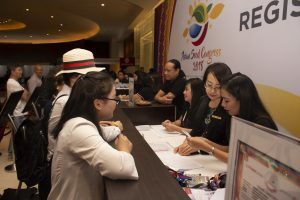 MANILA, the Philippines: Some 1,300 delegates from more than 50 countries have registered for the 25th Asian Seed Congress, scheduled 12–15 November at the Marriott Manila Hotel. Of this, US$3.74bn were imports, while US$1.49bn were exports, resulting in a trade deficit of US$2.24 bn. International trade in the APSA region – which includes all countries in East, Central, West, South and Southeast Asia, in addition to Oceania and the South Pacific – constituted a 13.3% share of the world’s seed export market, and 25% market share of imports, worth US$11.5bn and US$15bn, respectively. The region’s top seed supplier was China, which exported just under US$200 million worth of seed, representing 13% of APSA, and about 1.73% of the world seed export market. Trailing closely in second was India, which exported US$195.6mn in seed to claim 1.70% of the world, and 13% of APSA seed export market share. Thailand was third with US$186.45mn worth of exports (1.6% world, 12.46% APSA), followed by New Zealand (US$157.3mn), Israel (US$154.4mn), Japan (US$135.8mn) and Australia (US$99.8mn). 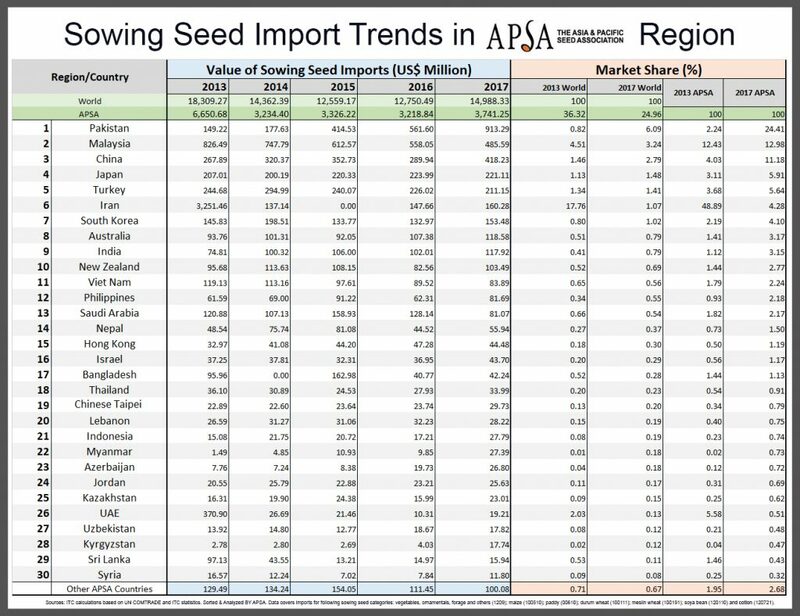 Only a handful of APSA countries sustain a surplus in seed trade: India, Thailand, New Zealand and Israel. Indeed, a majority of APSA countries continue to depend on imported seed to maintain food security. On both regional and global scale, seed outflow in many countries last year reached a five-year low. 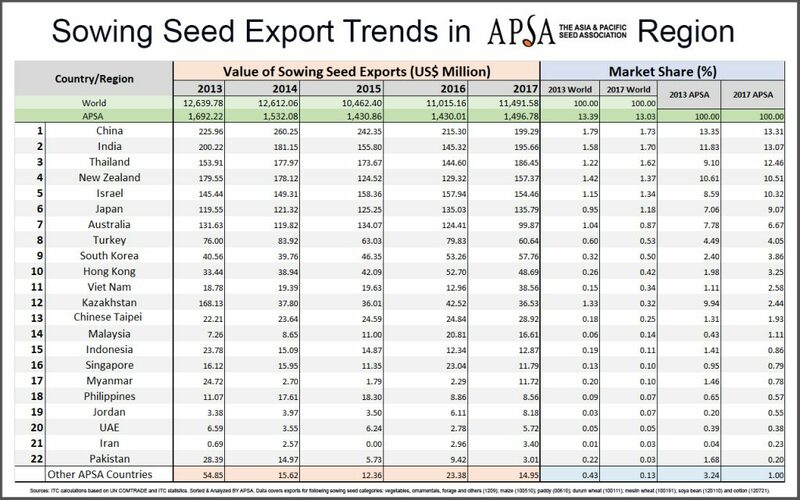 A case in point is the top three seed importers, Pakistan, Malaysia and China. From 2013 to 2016, Malaysia was consistently the region’s leading importer of sowing seed – importing between US$500 and US$800mn worth of seed annually. Most seed the Southeast Asian country imported was maize and soybean, consistent with the government’s policy of strengthening food security through cropping extension programs. Pakistan has been right behind Malaysia and is heavily dependent on bulk field crop seed consignments. Last year, the Himalayan country bumped Malaysia from the top slot to reign supreme in regional seed imports, bringing in seed worth US$913 million, including US$745mn of which was soya; US$54 maize and US$20mn paddy. As previously reported in Asian Seed Magazine, Pakistan in recent years has ramped up cooperation with Chinese agriculture companies through the China-Pakistan Economic Corridor, which includes a number of Chinese-funded agriculture projects, including some dedicated to breeding and seed production. China is rapidly becoming a leader in agricultural innovation and is actively promoting regional cooperation with neighboring countries through its Belt and Road initiative. Other leading agriculture nations – Australia, New Zealand, the Netherlands, France, Germany, US, Israel, India, Japan and South Korea – are also increasing agricultural investments and cooperation throughout the region, especially in developing countries in Central, South and Southeast Asia, the South Pacific, as well as in subtropical and tropical Africa. Indeed, strong regional cooperation is necessary to deal with an increasingly volatile climate, the emergence of new pests, and uncertain geopolitical affairs affecting trade. Such challenges – as well as strategies with which to overcome them – will be discussed at this year’s Asian Seed Congress in Manila, a dialogue that will certainly continue at the 26th Asian Seed Congress, which will be held in Kuala Lumpur, Malaysia next year. Reported figure covers consignments for various types of vegetable, ornamental and forage plants (traded using the HS code prefix of 1209…) as well as maize (100510), paddy (100610) cotton (120721), soybean (120110) and two different types of wheat – durum (100111) and meslin (100191). Not counted in this figure are seed potato, seeds of tobacco, herbs, spices or oleaginous fruits and plants, such as palm, melon or hemp. Moreover, available data reported for maize seed exports from Myanmar was excluded from the dataset due to anomalous figures that could not be verified.